The dynamic city of Busan, a leading city in Northeast Asia, is proud to present the 8th Busan Fireworks Festival, one of the most renowned festivals hosted by this city of maritime culture and tourism every year. 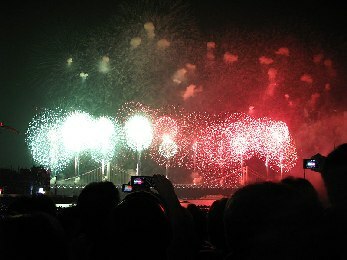 Tens of thousands of fireworks and state-of-the-art lasers light up the sky in harmony with the theme song of the festival against a backdrop of the sea and 2 level suspension bridge, Gwangan Bridge. In 2012 the festival will be held on the 26 and 27 October. This year a K-Pop concert featuring some of Korean pop music's biggest names with its new global fan base will be held to promote Korean pop culture as well as the dynamic city of Busan, as part of the Visit Korea Year Campaign. On the second day the main event will be kicking off with some major pre-event performances, with the participation of many citizens and students, followed by a countdown ceremony signalling the start of the Busan Fireworks Show, the fireworks display will feature various special effects including the famed Niagara Falls fireworks cascading from Gwangan Bridge. Tongyeong International Music Festival is an annual music festival held in Tongyeong City of Gyeongnam Province. TIMF may be classified into one of Korea's leading arts and music festivals which is specialized in western music, i.e. with a variety of style and genre, such as contemporary, early (baroque), classical, romantic, traditional, symphonic, chamber or ensemble, operatic or music theater. In spite of its various appetite for genre, TIMF is usually known as being strong in contemporary program of western style music. As well as composers, TIMF has also presented outstanding musicians and performers including globally recognized orchestras, chamber ensembles, soloists or operatic productions. Hi! Seoul Festival is a seasonal cultural festival held four times a year every spring, summer, autumn, and winter in Seoul, South Korea since 2003. It is based on the "Seoul Citizens' Day" held on every October since 1994 to commemorate the 600 years history of Seoul as the capital of the country. The festival is arranged under the Seoul Metropolitan Government. The Hi Seoul Festival 2010 will be held over nine days (from Saturday, October 2 to Sunday, October 10) at various Hangang (River) Park locations including Yeouido, Banpo and Seonyudo and plazas around downtown Seoul. Incheon Pentaport Rock Festival is a rock festival, which is held annually in Incheon, South Korea for three days at the end of July. 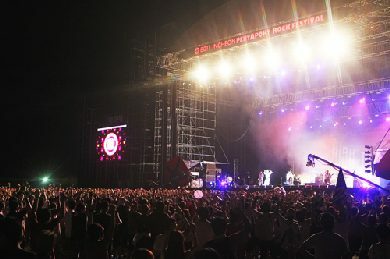 It is considered as one of the biggest live music events in South Korea and it's reputation grows each year. The festival has been recognized for its popularity by the Ministry of Culture, Sports and Tourism and is listed as one of Korea’s best festivals. The festival takes place at Incheon Dreampark area, southern part of Incheon Metropolitan City. The festival covers various genres of music, but mainly rock music and electronic music. The name came from five main themes of the festival; music, passion, environment friendly, DIY, and friendship. Past editions have included renowned artists such as the Stereophonics, Ian Brown, Kasabian, Feeder, The Chemical Brothers and Muse and many more. 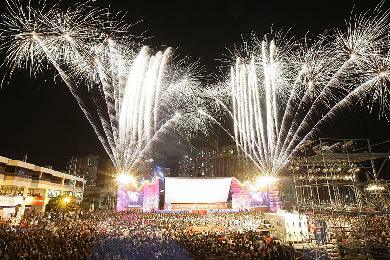 Busan International Film Festival is held annually in Haeundae-gu, Busan. It is one of the most significant film festivals in Asia. The first festival, held from September 13 to September 21, 1996, was also the first international film festival in Korea. The focus of the BIFF is to introducing new films and first-time directors, especially those from Asian countries. The 16th BIFF in 2011 saw the festival move to a new permanent home, the Busan Cinema Center. The Cinema Center includes a 4,000-seat outdoor theatre; four indoor screens under an LED-covered roof; media centre; archive space; and conference rooms; allowing the festival to include industry forums and educational activities. The Gala Presentation screens new master cineastes, the year's most-talked-about films, and world/international premieres whilst the World Cinema section of the festival presents new works by world-renowned filmmakers along with the year's best films that help understanding the recent trends in world cinema. A number of awards are handed out every year.